Finding the artistic rhythms among us! 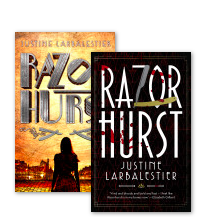 Events and Reasons to Celebrate in Your Library! Thank you for making The 5th Annual 2018 Authors Among US a HUGE, HUGE Deal – A major thanks to ASF Security/Police, Maintenance, ASF administration, students, US Library Media Center, ASF faculty, Ms Magy at ASF US, Middle School Faculty, Terui and Hugo at the FAC, Mr Buckley and Ms Ritter at ASF, the time the authors took out of their schedule, Porco Rosso of CDMX, and you the attending individuals that made this a hit! April 23, 2018 at the American School Foundation A.C.
Adi’s visit yesterday, to our 6th Grade English class, was great! He has a great demeanor with our students, and our students had LOTS of questions for him about being a writer, his inspirations and challenges as a writer. Having Alaya come in was awesome. The intimate setting worked really well. We are currently reading The Outsiders and exploring themes and character development, and Adi did a nice job explaining how he develops these literary aspects in his writing. Students had lots of access and were able to ask all the questions they wanted. It reinforced a lesson I was working on, which was really cool. Adi brought a bag of books, and students who asked a question were able to select a book — which made them even MORE excited! 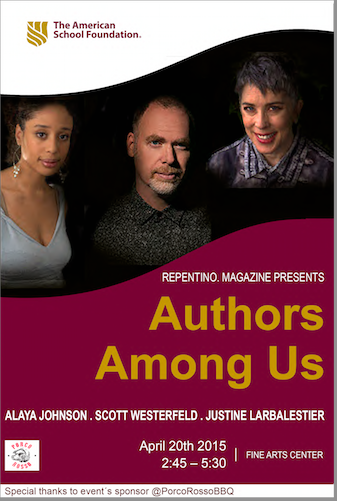 The event Authors Among Us, hosted by Repentino. magazine will be held on April 23rd in the FAC during afterschool. Food will be served from 2:45 – 3:30 at the Founders’ Garden, the event will start at 3:30 and end at about 5:45 pm. The authors, Alaya Dawn Johnson, Adi Alsaid (YA author), Louis Cotto-Vasallo (photographer/poet), Dr. Robert Snyder, and Jack Little (Editor of the OFI Press) will be speaking about their experiences as authors to the students. We highly recommend you to encourage your students to attend this event and we also encourage you, teachers, to attend. We will be very grateful for having all of the ASF community we can get! Adi Alsaid , (YA Author) was born and raised in Mexico City. He attended college at the University of Nevada, Las Vegas. After graduating, he packed up his car and escaped to the California coastline to become a writer. He’s now back in his hometown, where he writes, coaches basketball, and makes every dish he eats as spicy as possible. In addition to Mexico, he’s lived in Tel Aviv, Las Vegas and Monterey, California. Thanks to Adi Alsaid, the idea of Authors Among US became a reality. Louis Cotto -Vasallo (Poet Author and Photographer), born in New York to a family of Puerto Rican descent, Cotto found his experience and understanding of the world greatly broadened through travel to over twenty countries and his work with the U.S. Diplomatic Corps in Havana, Cuba. An accomplished writer as well as a self-taught artist, Cotto has produced six books of love poems in both Spanish and English, two musical plays, and a song that was played on New York radio. Jack Little (Editor of the OfI Press), Poet, teacher, editor, translator, is the co-origintor of the poetry and literary night at the Mexico City American Legion, and former player and manager for Mexico Cricket. 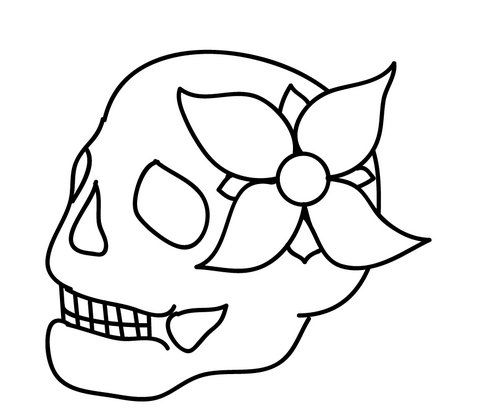 Jack Little is indeed the founding editor of The Ofi Press, a literary magazine with over 50 published editions, editor of the Ofi Press Contemporary Mexican Poetry series, publishing young Mexican poets in translation. Dr. Robert Snyder (Professor, Former U.S. Army Officer, completed his Master of Education degree in Elementary Science and Mathematics in 1997 at SRU and in 2001, he received a Ph.D. in Instruction and Learning with an emphasis in Science Education from the University of Pittsburgh. As an officer serving 15 years in the Army Reserve Military Police Corps, Dr. Snyder reached the rank of captain and served one year on active duty as a battalion operations officer for the 400th Military Police Battalion in Baghdad, Iraq in support of Operation Enduring Freedom and Operation Iraqi Freedom. His published works include articles in Science & Children (2012, 2010, 1998) and Science Scope (2005). His books teach children what veterans do and how they make sacrifices to protect the country. What is a Veteran, Anyway? Why Did Daddy Have to Leave? I thought Authors among Us was a great event. It was so much fun and super interesting to know and learn about the authors and their inspirations. Authors among Us was a good place to socialize and meet new people that share the same love for books. It was really fun and a huge success. Thank you for this amazing experience. I loved the event. I liked how close we were to the authors and I loved how relaxed all of the authors were. I liked having so many authors there too because there was more than one answer/opinion to the questions. Overall I had a lot of fun last night. I think it was a great experience getting to know the process the authors go through. I especially found the revision process interesting where even the authors themselves become impatient. Overall, getting to know the different approaches to their novels/children’s book was entertaining and I learned a lot yesterday. Personal answers, and close environment. It was much more interesting than I had thought it would be, and I ended up staying much more than I had planned. I really liked how relaxed and conversational the event felt (instead of feeling like they were giving a speech, their answers felt really personal and genuine). Since they all write in different genres and have different styles, I thought it was really interesting to see how they approached the questions differently. This was my first time going to an Authors Among Us event and I totally loved it! I’ll be sure to go next year! I loved how each author brought in a different perspective through the life that they had lived and how each one broke the common definitions for writers that I had normally experienced. I also loved how each author brought up a passion for Mexico and it’s enriching culture that influenced their writings. Autographed texts will be available for sale at this event! Congratulations to our online winners from Authors Among US! Adi’s new book, North of Happy, releases April 25th! Alsaid also has a recent short story in an anthology titled, Welcome Home, which is releasing in the fall. 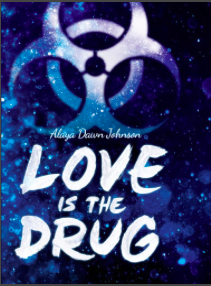 Alsaid also recently signed a new two-book deal with Harlequin Teen, with books coming out in 2018 and 2019. Last November, Mr. Lida published a novel, under the title ONE LIFE in English and CIRCUNSTANCIAS ATENUANTES in Spanish. The point of departure is work that I have done for the past ten years as a mitigation specialist. I do investigations for lawyers in the U.S. who defend undocumented Mexicans who are charged with capital murder and are facing the death penalty up north. We try to save them from that fate. The book tells the story of Esperanza, a young Mexican woman in jail in Louisiana, accused of murdering her eleven-month old baby. An American named Richard investigates her story to try to save her from death. Photographer, writer, former immigration officer, Legion Commander, Mr. Cotto Vasallo has a repertoire of diversity few can claim. After reviewing some photographs included in his book “Traveling in Other Worlds”. Luis Cotto Vasallo put together 50 snapshots broken down into 5 folders for us to preview. Some of these you will see below. His coverage includes Cuba, Italy, Mexico, Spain, and the United States. In addition to being in the right place at the right time, Mr. Luis Cotto Vasallo is on a rotating schedule as speaker to many locations within and outside of Mexico, as well as involved in many publishing endeavors. Mr. Cotto Vasallo has published several short story/poetry texts such as Dawn to Dusk, and Love Governs the Soul. Robert C. Snyder, Ph.D. is a Former Army Captain and Iraq war veteran who has served with the 400th Military Police Battalion in Kuwait and Iraq, and has been awarded the Bronze Star Medal for Merit. Snyder holds a Ph.D. in Instruction and Learning, with an emphasis on Science Education. Drawing on his own experience as a soldier in the U.S. Army, as well as an educator, Robert Snyder, Slippery Rock University professor of elementary education, has written a children’s book explaining the veteran experience. 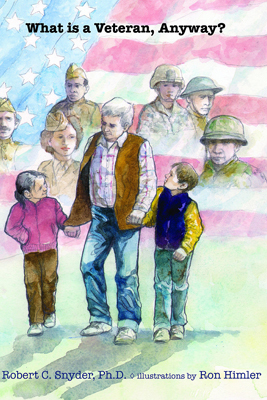 “What is a Veteran, Anyway?” will be published Sept. 26 by Blue Marlin Publications. The book’s publishing was timed to precede Veterans Day, Nov. 11. Snyder, a 1992 graduate of the ROTC program at SRU, received a commission as an officer in the Army Reserve Military Police Corps. In 2003-04, he served as the operations officer for the 400th Military Police Battalion in Baghdad, Iraq, in support of Operation Enduring Freedom and Operation Iraqi Freedom. His unit provided convoy security between Baghdad and Kuwait and operated seven prisons in the Iraqi capital. Snyder said the book narrative also promotes the importance of Veterans Day, which SRU traditionally recognizes with a series of events each year. Snyder plans to share his book with his students through a series of workshops on how to use children’s literature in explaining Veterans Day. All Things Neal Shusterman @ ASF! March 23rd – Neal Shusterman visits ASF Upper School Grade Level Meetings! Lots of cool activities and info at the table! that you can have chances to register – and win! Authors Among US recap – Huge Success! Author Among US Experience, check out our link here! and also, check out our first run at Author’s Among US last year! –here is last year’s gallery ! Authors Among US – April 25 2016! Sponsored by Porco Rosso and Repentino.! Authors Among Us Take Two! We will have a question and answer session four our four authors, Adi Alsaid, Zoraida Cordova, Osseily Hanna, a Hang Out On Air Session you can join, prizes, and much much more! Stay tuned for more info on coming authors! Drawings and Prizes available at the “Giveaway” tab on our Facebook page! Must be present April 25th to be eigible for prizes! November 5, 2015 Open Mic goes live! That’s right, November 5th marks the first time you can see an Open Mic live outside of ASF! environment, amid artists of all backgrounds. For inquiry int being a participant, or an attending member, please contact us at asflitmag@gmail.com. We are excited to initiate this new venture, and hope to see you there! Calle Zacatecas 102, Roma Nte., 06700 Ciudad de México, D.F. FREE AUTOGRAPHS! Win Prizes! Meet Famous Authors! 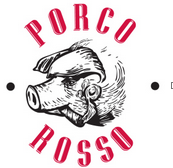 Thanks @porcorossobbq and Sobrinos in Roma for supporting ‪#‎authorsamongus2015‬ in so many ways! Tomorrow will be a smash thanks to your help! Please join us at 3:45! Click here for your personal invite. Congrats to all the applicants who have entered the online raffles! Winners will be announced today! Pulled Pork sanwiches, pizza, and the 2014-2015 Repentino. available for sale today! A formal talk with a Q & A Session will occur from 3:45 – 4:30 where a Live Twitter Chat will also be possible. A follow-up autograph session will conclude the community event, happening from 4:45 – 5:30 PM. We will also be offering several chances to win the opportunity to participate in a dinner with the authors and more!… on April 20th. These opportunities will be based on various trivia pieces and a scavenger hunt with raffles that will involve the authors’ novels! Want to see a video of their publishings? Here they are! Pingback: Lucia and Red Ribbon | Repentino. In Uglies, by Scott Westerfeld, the author touches on the theme of empowering women by giving the protagonsist a choice. In today’s society many women do not have that choice, and many times women, such as the protagonist’s friend, are not seen as courageous or strong. 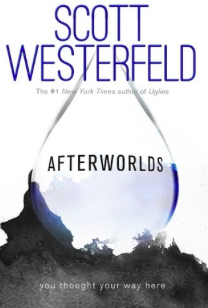 This is another thing Westerfeld achieves: brealing gender stereotypes. All women do not want to be pretty; there is more to it. Even if the novel, Uglies, is set in the future, It withholds many ideas that we see now a days. It captures and in a way makes ridicule of today’s obsession with perfectionism. I myself, have struggled with the idea of not meeting other people’s standards, of constantly worrying about my flaws and what others think of them, but after reading the Uglies collection, I’ve become to realize their is so much more to a a person than their physique. Also, as a woman, it has empowered many readers, including me, about not being afraid and standing up for what we believe is correct. The book also encapsulates the high price perfection may have. The book though, gives the two sides of the advantages and disadvantages of being “pretty”, allowing the reader to chose what’s morally correct. It causes conflict on both sides and persuades the reader to argue if this type of hedonism causes more harm than help and vice-versa.